We specialize in healthy, tasty food, at affordable prices. When you visit us, you’ll find foods prepared on-site daily. We use organic ingredients and chemical free foods. We offer you dishes that are naturally low in fat and cholesterol, yet high in taste. Our soups are prepared daily. We hope you enjoy your experience eating at Café Leila. Since 1979, the Sacramento Poetry Center has been a major force for literary artists in Northern California. Though primarily serving as the literary center for the greater Sacramento metropolitan area, SPC’s publications are recognized nationally for their quality and literary content and its annual writers’ conference has featured some of the most important poets of our time, including Pulitzer Prize winners Gary Snyder and Philip Levine, former U.S. Poet Laureate Robert Hass, and other poetic luminaries such as Galway Kinnell, Robert Bly, Robert Creely, Diane DiPrima, Carolyn Forche, Lucille Clifton, Anne Waldman, Jack Hirschman, Jimmy Santiago Baca, Dorianne Laux, Kim Addonizio, Lawrence Ferlinghetti, Michael McClure, Jose Montoya, Robert Creeley, Robert Peters, and many others. Thanks to Lois Requist, fourth poet laureate of the City of Benicia, for inviting me to read poems from my new collection, Wisteria from Seed, in the Benicia Literary Arts Salon series, hosted at Bookshop Benicia by proprietor Christine Mayall. I will also be talking about the process of getting my poems and my first collection of poetry published. Bookshop Benicia opened in July of 1993. From the first day we opened for business we have striven to be a true neighborhood bookstore for the Benicia and Vallejo communities. Those of us who work here do so because we not only love books but we also love sharing that enthusiasm. We believe in the power of the written word to change lives and broaden personal horizons. We believe that communities deserve their own locally owned bookstores, businesses that respond to and reflect their neighborhoods. Thanks to Bruce Bagnell for inviting me to read from my poetry collection, Wisteria from Seed, in the weekly Poetry Express series (website here, FaceBook page here) one of the longest running poetry venues in the area (going on about 14 years now). 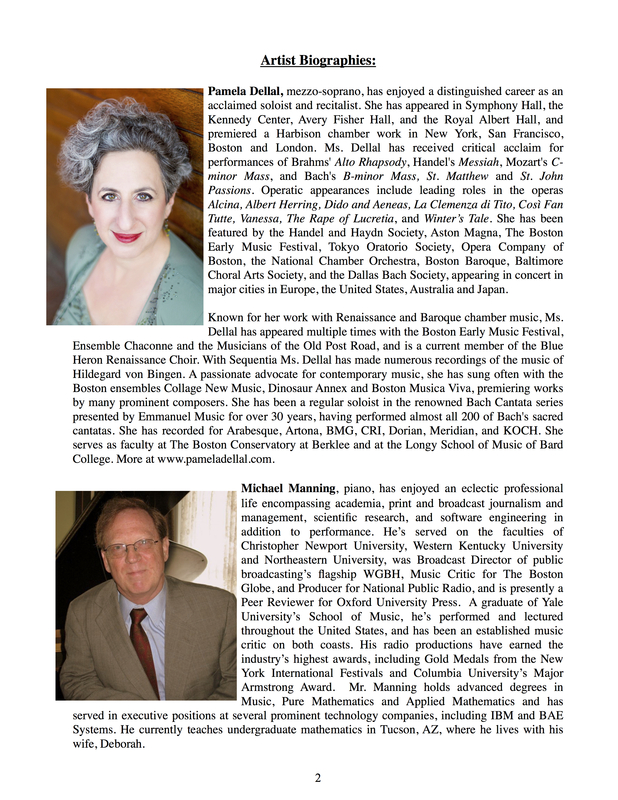 PoetryExpress has featured many well known poets. Thanks to Sande Anfang for inviting me to be a featured reader in the Rivertown Poets series, a monthly poetry series held on the first Monday of every month at the Aqus Cafe. Open mic, too! The bustling scene on a regular weekday morning at Aqus Café at Foundry Wharf might appear to the first time visitor as one not unlike any other popular West Coast coffee shop….Yet if you sit awhile with your bowl of organic soy latte, steaming mug of exotic herbal tea, it won’t take you long to absorb the extraordinary atmosphere that makes Aqus Café the region’s most talked-about hot spot of modern social capital. 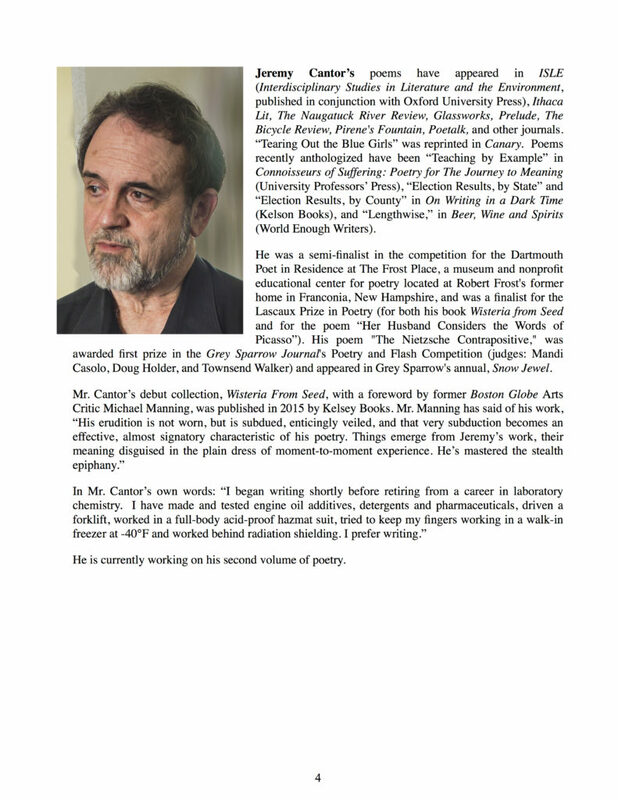 April 19, 2015 Reading at Napa Bookmine (map here) 2015 at 2:00 PM. I’ll be participating in a reading by several poets including Beclee Wilson, the new Napa County Poet Laureate, to celebrate National Poetry Month. The event starts at 2:00, and I’m scheduled for 3:15. Naomi Chamblin and her husband Eric Hagyard are co-owners of Napa Bookmine, a small independent bookstore. Naomi grew up working at her father’s epic used bookstore, Chamblin Bookmine in Jacksonville, Florida. Her father shipped 20,000 used books from Florida to her Napa store in a boxcar. So this poet and Wisteria from Seed will be right at home in this Napa Valley bookshop. Thanks to Barbara Heppe for inviting me for an Author’s Meet-and-Greet! Copperfield’s Books in Napa is nestled next to Whole Foods Market at the Bel Aire Shopping Plaza and is a book lovers’ bookstore. Compelling sections in both cooking and travel draw the locals from Napa as well as visiting tourists. The graphic novel section and the children’s section are both noteworthy for their offerings. This store is home to Copperfield’s Cooks, a free event series featuring renowned chef authors. These events take place in Culinary Center in Whole Foods, behind the bookstore and provide an opportunity for food lovers to meet great author chefs, purchase their featured cookbooks, and also taste their recipes (courtesy of our partner Whole Foods). Events livestream at http://www.ustream.tv/channel/sacred-Grounds-café, and the video is later transferred to YouTube. Thanks to Dan Brady for the invitation to read at “the longest running Poetry open mic we know of (since 1972)”! Quasi ground floor/basement space that feels warm and cozy instead of dark and cramped. Maybe it’s the quiet but nice owners and the clientele that ranges from parents with small babies to students and true hippies (that anchored this neighborhood when it was shabby and a lil dangerous) that give The Sacred Grounds a nicely worn feel like a favorite old shoe. And they make a really good Americano. I’ll be sharing the mic with my friend Peter Bray, also of Benicia, and the only poet I know who featured in Herb Caen’s column back in the day. The Last Word Reading Series (2nd Fridays) is presented by Nefeli Café, a café/restaurant that serves dinners, tapas, coffee drinks, beer, wine and more in a beautiful and colorful atmosphere. Dinner here is wonderful and should not be missed. Admission is free, but a one-drink or one-plate minimum is suggested. Dale Jensen, Ralph Dranaw, John Rowe and Grace Grafton are co-hosts. Two features each month plus open reading. 1) Do not take Route 37 (sometimes known as “Sears Point Road” or “Blood Alley”) — it will be bumper-to-bumper with Sonoma Raceway traffic. Instead, cross the bay via the Richmond-San Rafael Bridge. for instance, the Lucky/Doherty exit off 101 has a sign in the southbound direction that shows an exit number, but the sign you see for that exit going northbound does not. Book Passage has served the Bay Area for more than 30 years, providing the community with an array of author events, writing and language classes, and highly-respected annual conferences. A New York Times-reporting bookstore, we offer a wide variety of books ranging from children’s literature to travel guides, from top-selling fiction to mystery novels, and we continue to work diligently with community and nonprofit organizations. Book Passage has two stores, one in Corte Madera and a second in the San Francisco Ferry Building. I am honored to be scheduled to read at this venue. A glance at Book Passage’s events calender will show you why! Thanks to Cathy Dana for inviting me to read at the Bette Center. I’ll be joined by fellow Benician, poet and songwriter Peter Bray, the A Capella Handyman (www.peterbray.org/pedro)! Thanks to Jeanne Lupton for inviting me to read at the Bette Center. 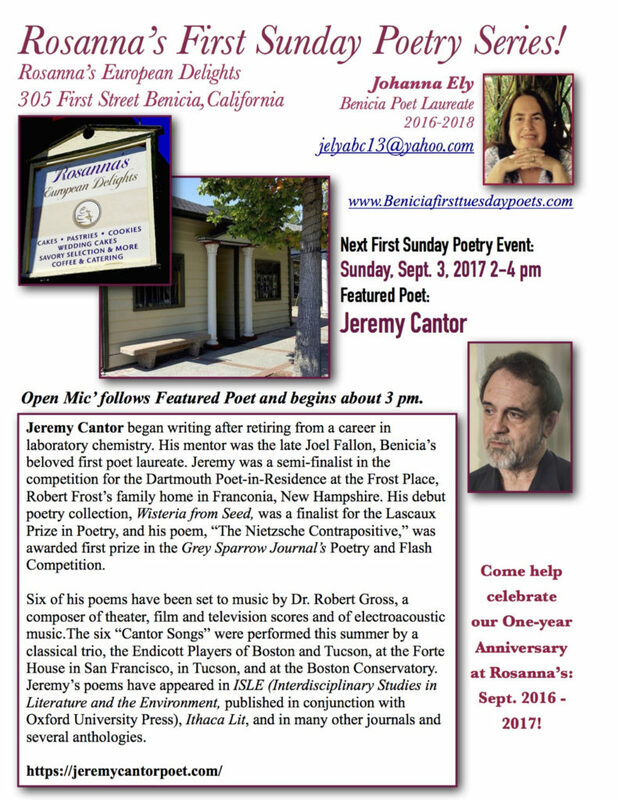 Thanks to Benicia’s poet laureate Johanna Ely for inviting me to help celebrate the first anniversary of her Sunday poetry series at Rosanna’s! “Rosanna’s European Delights is a full-service pastry and cafe, specializing in traditional and creative baked goods for families and businesses throughout the Solano County area. The next time you are craving sweets or treats, come visit us before settling for prepackaged baked goods from the grocery store. 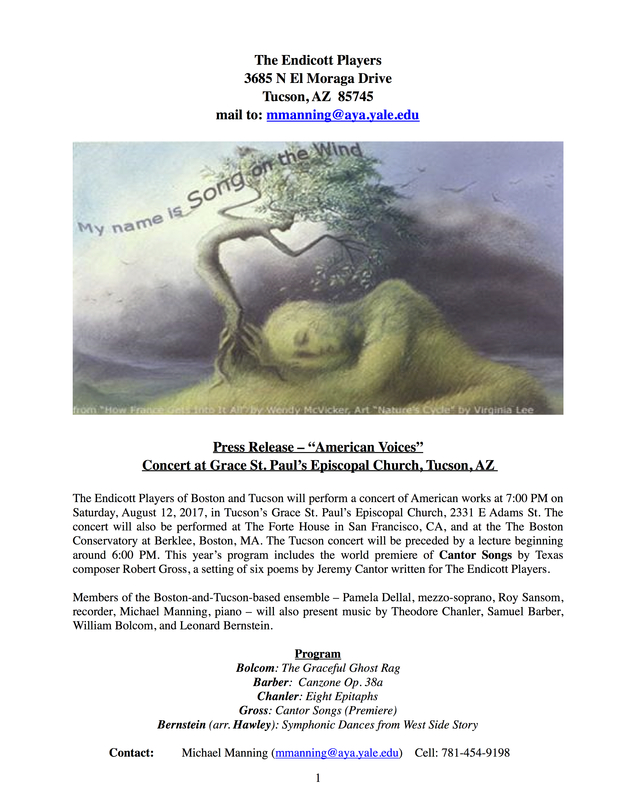 Composer Robert Gross has set six of my poems to music, and they will be part of a program of American music performed by the superb classical (this is the colloquial use of the word “classical”) trio The Endicott Players in three concerts, in Tuscon, San Francisco, and Boston. 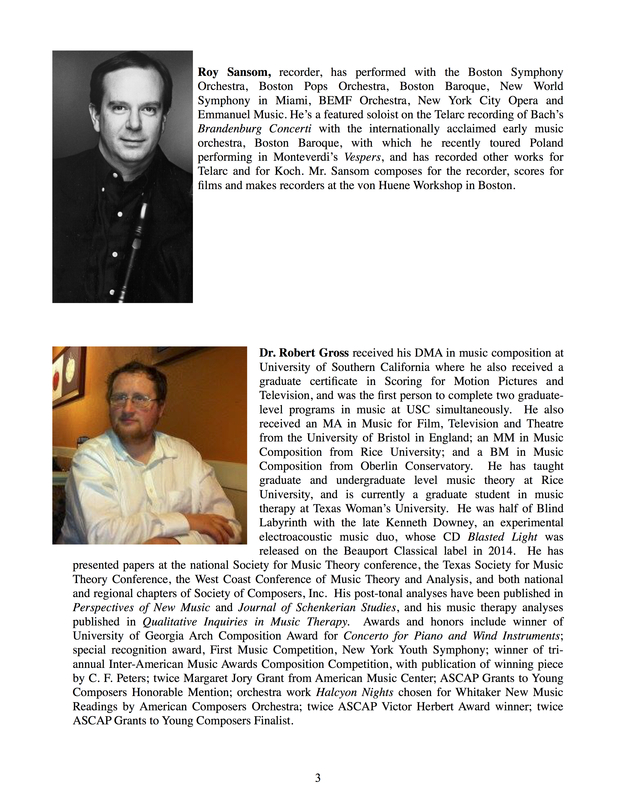 Expect these very knowledgeable musicians to include fascinating background information along with the music. 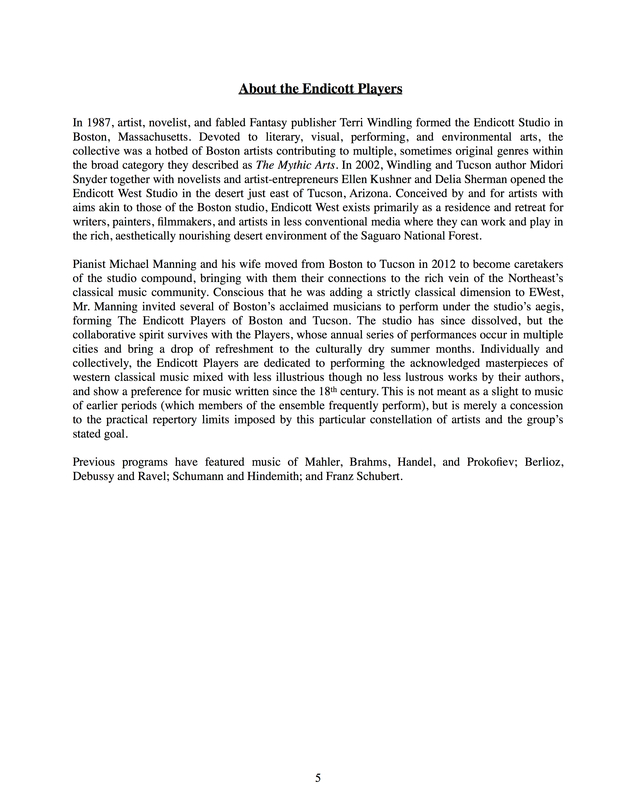 (By the way, the pianist, a former columnist for the Boston Globe, wrote the text you’ll find on this website, at the tabs “Foreword” and “Introduction.”) I found Bernstein’s Symphonic Dances from West Side Story, arranged by Michael Hawley for solo piano (not the way that music is usually heard!) to be a revelation. 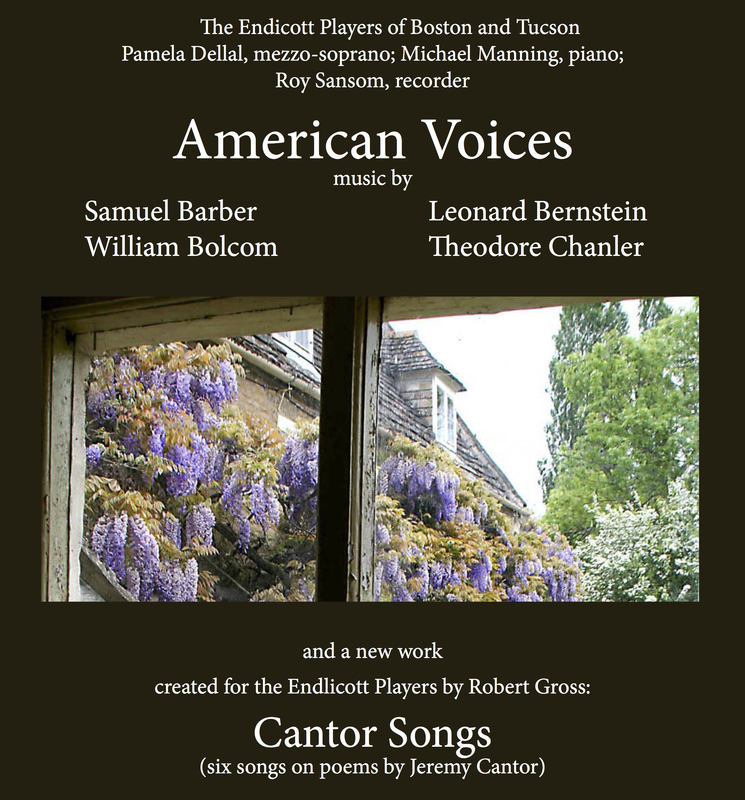 Pamela Dellal’s interpretation of my poetry and Dr. Robert Gross’ compositions perfectly carried along and emphasized my meaning.